This is a different kind of post from what I usually talk about here. Today I'm writing a very personal post because I'm so incredibly thankful my son is alive and safe. We live in a part of BC with roads that can be terrible, roads that are often completely ignored by the road maintenance crews. The exception for our lack of road maintenance is usually after a severe accident, especially after someone has died. My heart goes out to the families of everyone who has died needlessly from something so preventable. Last night my son did not die. Whether it was due to his presence of mind while he was upside down and submerged underwater and trapped in his seat belt, or it was just luck, or something bigger than all of us was watching over him, I don't know. Somehow he is still with me today. This is the situation he found himself in while driving approximately 20 km/hr. And what he got himself out of. Somehow. In this next photo you can see the passenger window, his escape route. Take a moment to imagine. You'll need to start by envisioning complete blackness, because it was nighttime. 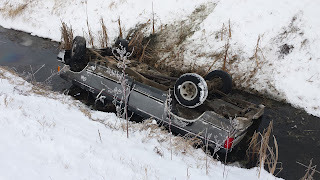 The driver's side was submerged in mucky, stinky, ice-cold water, covering my son's head. He had to get his feet onto the ceiling of the truck so he could get the tension off the seat belt to unfasten it. Then maneuver to the passenger side and then find and open the window, despite being disoriented because the truck was upside down. The tow truck driver told us that most people panic and can't even realize which direction is up, let alone go through all the steps required to escape from an overturned vehicle in the water, in the dark. Most people in this situation die. I can only imagine what he must have gone through. Half the time I can't find the door latch of my own car in the dark when I'm perfectly calm. My son has a good head on his shoulders. He got out. I'm a lucky mom, right? But he didn't have to go off the road in the first place. He was doing all the right things. He has good winter tires. He carries weight in the back of the truck. He was driving at a reasonable speed for the conditions. The truth is that a few dollars' worth of gravel would have prevented this. A concrete barricade would have prevented this. 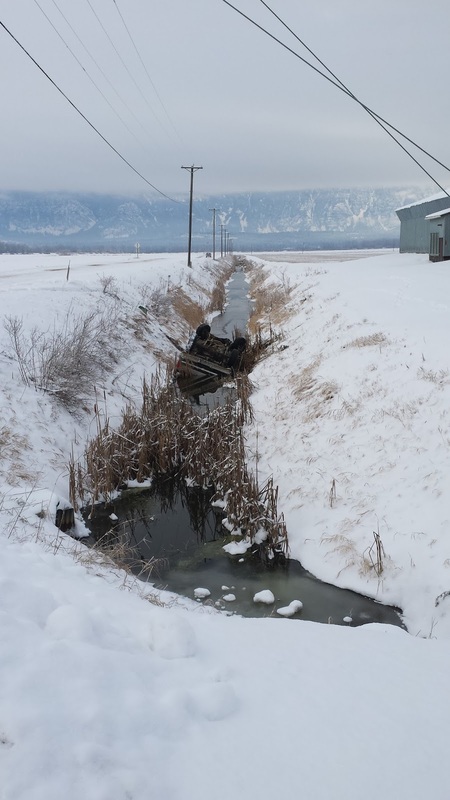 The truth is that roads beside irrigation ditches are too dangerous not to maintain. Combine icy roads with sharp corners and irrigation ditches and zero road maintenance, and you inevitably end up with vehicles upside down in the water. With people in them. It seems a no-brainer to me that there should be some kind of timely maintenance going on. Barricades on the corners, maybe? But what do I know? I mean, I value life over road maintenance dollars, I must be uninformed or something. Obviously, being a writer, I turned to words. I spoke on the phone last night to someone at YRB, the contractor responsible for road maintenance in the Creston area, and I was told that Reclamation Road was "on the list." I spoke to YRB again this morning when a sand truck still had not come. Twelve hours (and a second car accident) after my son went in that irrigation ditch, a sand truck finally came and sanded not only the corners but the entire road. This event reminds me very much of the winter a woman died in much the same way... the roads were not maintained at all, and then they were for a few months after her death... and then not at all. Something awful has to happen before YRB will mete out a handful of gravel. I've spent some time talking to various people about YRB's company policies, and some interesting themes have come to light. People who care talk. Of course, due to strict nondisclosure agreements, nobody wants to make public statements about YRB. The road maintenance company is well insured, and it's more economical to deal with lawsuits than to adequately maintain the roads. The road maintenance company's employees receive bonuses for not using the blades on the plow trucks. The road maintenance company's employees receive bonuses for not using sand and salt. The road maintenance company's policy of valuing money over lives disgusts caring, conscientious employees, who then leave the company, resulting in an alarmingly high proportion of uncaring, unskilled workers on the maintenance crews. It's certainly worth looking into, don't you think? Please join me in letting BC's Minister of Transportation & Infrastructure, the Honourable Todd Stone, know that road maintenance is not the place to be cutting budget dollars, and that we need transparency in the policies of government-paid contractors. Click here to send a tweet to Todd Stone. Feel free to post the link to this blog post. You can also share this post on the YRB Twitter page. Are you ready for the second Chloe story? 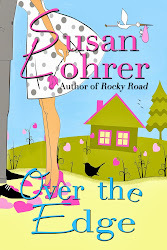 Today is release day for Unwrap the Romance! This collection of six heartwarming Christmas stories, including A Gift for Chloe, is available exclusively on Amazon for $.99. Click here to buy your copy now. Want to be notified about my new releases? Sign up for my newsletter (it's short and sweet and comes out about twice a year). I am so proud to be part of this group of amazing authors. (Not to mention... at long last, I have another new release, woo-hoo!) Thanks so much to everyone who loved "A Gift for Chloe" and asked for the story of Chloe's parents. Thus was born A Christmas for Chloe. This Christmas anthology currently is available exclusively on the Amazon Kindle Store. 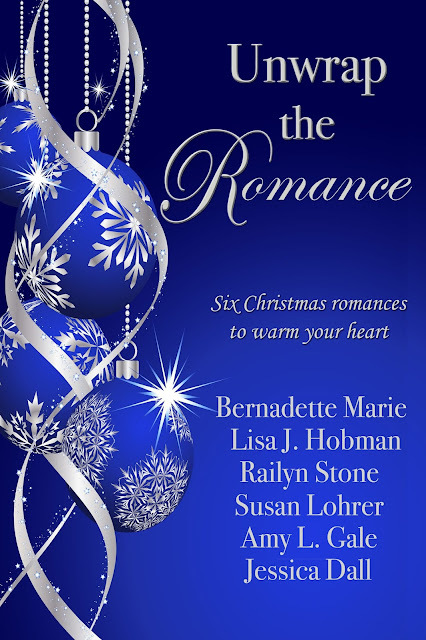 You get six heartwarming Christmas stories for just 99 cents. Click the cover to buy the book! 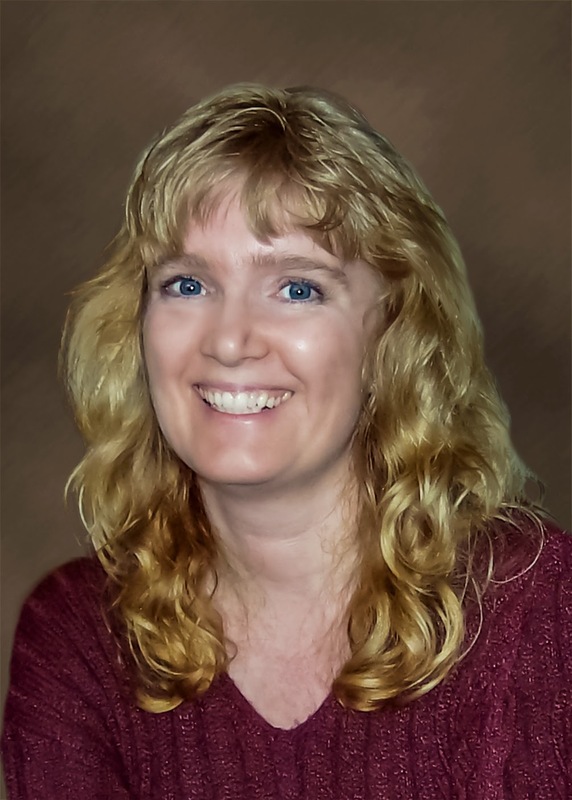 Bestselling Author Bernadette Marie is known for building families readers want to be part of. Her series The Keller Family has graced bestseller charts since its release in 2011, along with her other series and single title books. The married mother of five sons promises Happily Ever After always…and says she can write it, because she lives it. Lisa is the best-selling author of several contemporary romance novels. After growing up in Yorkshire she began her writing career back in 2012 following a move north of the border to Scotland. She takes much of her inspiration from the stunning, scenic Scottish countryside she now calls home along with her husband, daughter and two dogs. Railyn Stone, author of The Christmas Tree Guy and A Secret to Keep, lives in North Carolina with her husband. When she’s not behind the screen of her laptop, she’s usually enjoying time with her family. The only child of two educators, she learned early on just how magical words can be. 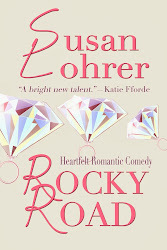 Romance author by night, pharmacist by day, Amy L. Gale loves rock music and the feel of sand between her toes. 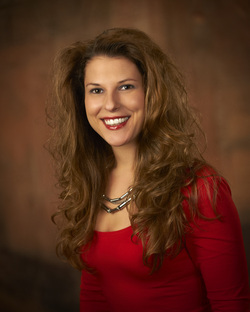 She attended Wilkes University where she graduated with a Doctor of Pharmacy degree. In addition to writing, she enjoys baking, scary movies, rock concerts, and reading books at the beach. She lives in the lush forest of Northeastern Pennsylvania with her husband, six cats, and golden retriever. 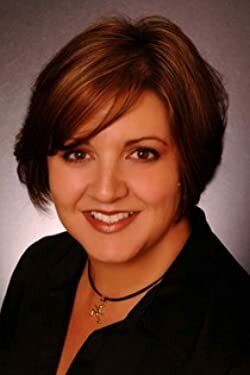 Jessica Dall is the author of such novels as Raining Embers and The Paper Masque and a number of short stories that have been published in both literary magazines and anthologies. 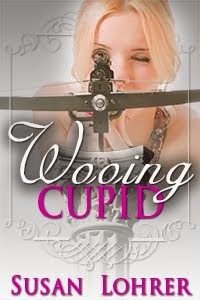 When not writing, she works as an editor and creative writing teacher in Washington, DC. Buy now on the Amazon Kindle Store.